The Hanover FC flag which appeared on a anti-internment bonfire. A local football club has described the placing of their flag on top of an internment bonfire as a ‘hate crime’. A Hanover FC flag - who are based in Portadown - was spotted on a bonfire in Craigavon on Wednesday evening. The actions have been widely condemned by local unionist and nationalist representatives, who also called it a ‘hate crime’. The flag had been created for the club to take to France in 2016 to support Northern Ireland in the European Championships. 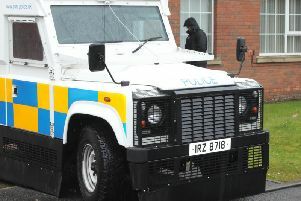 DUP Councillor Darryn Causby raised the issue with police and said there was a sinister element in targeting the club. He said: “To deliberately target a local football club who every year raise thousands of pounds for charity, have a growing youth football set up in Brownstown for girls and boys and who are well respected in their league and the footballing fraternity. “They have been on the go for over half a century and to attack them in that way is nothing short of disgraceful and disrespectful. “It is quite serious, that area in Craigavon would be associated with dissident republicanism and I would be concerned that there is a more sinister element trying to heighten tensions and target Hanover Football Club. The club issued a statement on Wednesday night, describing the incident as an attempt to stir up sectarian tensions. The statement said: “As a community based football club we believe this to be a serious hate crime and feel that this flag has been placed upon the fire due only to the fact that it has the constitutional flag of this country displayed upon it. “This flag was designed for club members who travelled to support Northern Ireland in the European Championships in France and we as a club feel that the burning of this flag is nothing other than an attempt by dissident republicans to furthermore stir up sectarian tensions in the local area through the glorification of terrorism. DUP MLA Carla Lockhart said: “I have spoken again with the PSNI concerning the bonfire in Drumbeg. It is unacceptable that a local football teams banner, our National Flag and a UDR regimental flag have been placed on the fire. “It is of note that the flags displayed on the fire look very similar to the 4 flags stolen from the Flush Place (Lurgan) flag pole at the weekend. The presence of the flag of our country and that of one of the military regiments who served with distinction in the most difficult of times is an indication of the respect and tolerance shown to Unionists. “Given that Republicans cannot even say the name of our country why should we be surprised that this vacuum is filled by people who want to burn our flag and a banner from a community lead football team. “I welcome the condemnations from across the board and welcome that the PSNI are gathering their evidence, investigating and that one arrest has already been made in connection with the bonfire. This cannot and will not go unchallenged. Cllr David Jones, independent Councillor at ABC Council said: “I am totally dismayed and disgusted to learn the flag of the local Hanover Football Club, a club that gives a tremendous contribution especially to young people, has been placed on a republican bonfire in Lurgan.